Welcome to Day 6 of Unit 4: Android Game Development. In the last lesson, we have created the interface for our AndroidGame project. We will move on to the second part of the Game Architecture: the implementation. Using the "skeleton" that we have created in Day 5's lesson, we will now create the bridge between Android code and your Game. In the implementation, we will literally implement (using the built-in word "implements") each of the interfaces from Day 5. In terms of the code, we will be importing many Android classes and calling various Android methods. There will be 9 classes for implementation and 3 helper classes for touch. This is one of the most important lessons in the entire tutorial series, so take your time with this one! Note: The framework developed below is from a great book on game development called Beginning Android Games Development (by Mario Zechner and Robert Green). If you would like to explore the topics covered here in much more depth, I highly recommend that you pick up this book. It is very informative and well-written. Here's the link to the book! The writers of the book graciously provided this code under Apache 2.0 license, so you can use it in both commercial and non-commercial projects. More on that here. In your AndroidGame project's src folder, create a new Package. This is where our implementation (all 10 classes) will be stored. Remember: All the code that follow will assume that your package is com.jamescho.framework.implementation. If you have a different package name, you will have to correct your "package" declaration (and all subsequent import statements)! Right click on com.yourname.framework.implementation and create a new Java Class called AndroidGame. This class is the backbone of your game that holds everything together. Upon creating this class, you will have multiple errors. Please ignore these errors for now! We will fix them one at a time, so do not worry. Before we create the other implementations, let's first talk about the important objects and methods in this code. Look at the code as I describe the important pieces of it below. You do not need to type anything. 1. The Android libraries - If you look at the first 10 import statements, you will see they all begin with "android." This means that these are Android based classes stored in the SDK Platform. - An Activity is usually an interactive window. For a typical application, you might have multiple activities (usually one for each screen). For example, you might have an activity for the login screen, another activity for the settings page, and so on. Activities are made up of components called Views (elements on the screen such as images or text). - Bundle lets you pass information between multiple Activities. Going back to the example of a login screen, a Bundle might transmit your login information to another activity that checks it to grant access. - PowerManager.WakeLock is used to prevent the phone from going to sleep while our game is running. 2. Notice that we are importing our interfaces in the second set of imports. Using them, we create objects in the variable declaration section. Also notice that our class AndroidGame extends Activity and implements Game (This is the implementation of the Game interface). 3. In the code, we first see an onCreate method. To understand this, you must first understand the Android Activity Lifecycle. - Since Android is a mobile platform, your App's current Activity (the current page on your Application) can be paused or resumed (or created, stopped, destroyed, or restarted) depending on what happens to the Android device. For example, if the user receives a phone call, your activity will be Stopped (it will no longer be visible). Similarly, if the user presses the home button (taking your activity off of the screen into the "stack") and navigates back to your application to reopen your Activity, your Activity will have been stopped and restarted. Therefore, your application must call methods to handle these transitions without errors, crashing, or loss of progress. - Let's go back to the onCreate method. The onCreate method is called when the activity is created for the first time. Notice that it has the @Override annotation, meaning that this method belongs to the superclass (remember we extended the Activity superclass). Typically, in the onCreate method, you will set the layout (appearance) of the activity. As we will in each stage of the Activity Lifecycle, we first call the super method (that is the default onCreate method in the Activity class), remove the Title of our Application (applications have a title bar by default), and set our application to "full screen." 4. We then check the current orientation of the device and set the Width and Height of our Game. This question mark is a way of evaluating a boolean. If the boolean isPortrait is true, frameBufferWidth takes the value of 800. If it is false, it takes the value of 1280. This is where we would change the resolution of our game. We will be using 800x480 (to support lower end devices). If you wanted to dynamically adjust our game's resolution (so that the game always runs on the native resolution), you could use if statements to only call the game classes designed for that resolution, but we will be taking a one-size-fits-all approach for the purposes of this tutorial. 5. We then proceed by creating floats to scale and adjust everything to the device's aspect ratio. 6. Next, we define each of the interfaces by creating new instances of the implementation classes that we will be creating. 7. Notice that we also use the PowerManager to define the wakeLock variable and we acquire and release wakelock in the onResume and onPause methods, respectively. Why only these two states and not the onStart and onStopped methods? If you refer back to the Android Activity Lifecycle, you will notice that the onResume and onPause methods are always called before and after an activity becomes visible. Therefore, we can, for the most part, ignore onStart, onStopped, and etc. 8. The rest of the AndroidGame class defines additional methods to return various interfaces, and we also define the setScreen and getCurrentScreen methods from the Game interface. A lengthy explanation, but this should give you a slightly better understanding of how our Game Architecture (interface, implementation, game code) works. Before moving on to the other implementations, I suggest that you study the relationship between the AndroidGame implementation and its Game interface, because the rest of the lesson will basically be variations on the same theme. 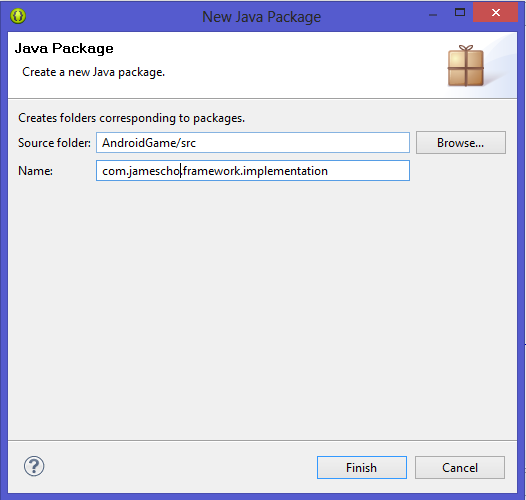 Right click on com.yourname.framework.implementation and create a new Java Class called AndroidGraphics. Here, you will implement the many abstract methods that you have created in the Graphics interface. REMEMBER TO CHANGE THE PACKAGE IN THE PACKAGE AND IMPORT DECLARATIONS. throw new RuntimeException("Couldn't load bitmap from asset '"
The graphics class is pretty straight forward. The three important classes here are Bitmap, Canvas, and Paint. 1. Bitmap just allows you to create image objects. 2. Canvas is really a canvas for your images. You draw images onto the canvas, which will appear on the screen. 3. Paint is used for styling what you draw to the screen. When you draw an image to the screen, you first store it to memory, and you just call the same file from memory each time that this image is used. No matter how many GBs are in a device's RAM, only a small chunk is dedicated to each app. This "heap" can be as little as 16MB, so you really have to be careful with memory management. So how do you conserve memory? To do so, you need a good understanding of ImageFormats. Before we discuss ImageFormats, let's first see how much memory a typical image will take up. Each pixel in an image takes up a bit (1/8 of a byte) of memory. So you can calculate the total memory usage by multiplying the width and height; however, there is a third dimension to consider: depth. This is where ImageFormats come in. You will recognize the following ImageFormats from the Graphics interface (RGB565, ARGB4444, ARGB8888) in the code above. These are three formats that can be used when storing images to memory. The first (RGB565) takes up the least memory (at least in practice). Red, Green, and Blue (RGB) have depths of 5, 6, and 5, respectively. However, there is no Alpha value (opacity/transparency) to consider. The second (ARGB4444) has a total depth of 16. (Use this when you need transparency in your image). The third (ARGB8888) has a total depth of 32. (You should almost never need to use this format. ARGB4444 usually is enough). To simplify, the quality of your image will improve if you use the 3rd format as opposed to the 1st, but you will take up memory much faster. A single 1000x1000 image with depth of 32 will take up 32,000,000 bits, or 4MB. If you have four of those on a device with 16MB, you will get an out of memory exception and your game will crash (this assumes you have no other objects stored in memory, which is impossible). In the AndroidGraphics Class, you will find many drawing methods that we will call throughout our development. Don't worry about the try, catch, and finally statements. They will do all the "dirty" work behind the scenes for you. Let's move on to the other seven implementations. Right click on com.yourname.framework.implementation and create a new Java Class called AndroidFileIO. Here, you will implement the many abstract methods that you have created in the FileIO interface. Right click on com.yourname.framework.implementation and create a new Java Class called AndroidAudio. Here, you will implement the many abstract methods that you have created in the Audio interface. This is also a pretty straight forward implementation. SoundPool is worth mentioning here. This class is used to manage audio resources from memory or from the file system. Typically, short sounds (which are repeated over and over again) can be stored to memory. This reduces load from the CPU; however, longer sounds (which are lengthy and take up a lot of memory) can be played directly from the file system. This is why we have two types of Audio in our game: Sound and Music. Let's implement those next. Right click on com.yourname.framework.implementation and create a new Java Class called AndroidSound. Here, you will implement the many abstract methods that you have created in the Sound interface. The AndroidSound interface uses the SoundPool and an integer ID to keep track of various sounds, play them, and dispose them from memory. Let's see how music is handled. Right click on com.yourname.framework.implementation and create a new Java Class called AndroidMusic. Here, you will implement the many abstract methods that you have created in the Music interface. This class defines various methods used for playback. Although much lengthier than the AndroidSound implementation, this class is also very straightforward. The most important part of this class is the MediaPlayer object, which handles audio/video playback on Android. There are various listeners that check for changes in playback (these listeners are not unlike the KeyListeners from our Unit 2/3 game. They check for an event and carry out an action). Let's now move on to Rendering. Right click on com.yourname.framework.implementation and create a new Java Class called AndroidFastRenderView. Above, I mentioned that an Activity (a window) has a component called a View. This class creates a SurfaceView (which you can use to create graphics-based UI and update very quickly). It is this class that gives us a direct window into our game. Also notice this is where update() and paint() are called "internally" (much like how update() and paint() were called automatically in our applet). An important variable here is the deltaTime variable, which checks how much time has elapsed since the last time the update/paint methods were called. To understand why this is important, we should talk about frame rate independent movement. In our game from Units 2 and 3, we had a frame rate dependent movement. Although we fixed the frame rate at 60, if the game slowed down due to heavier load on our CPU and dropped the frame rate to 30, our character's movement speed would have been halved. This was fine for our computers, which could easily handle the simple applet without slowing down. However, Android devices are rarely powerful enough to maintain 60fps indefinitely. The CPU will be burdened with incoming messages, internal changes, and much more. That means that the frame rate will fluctuate. To prevent movement speed from depending on frame rate, we use this deltaTime variable to check how much time elapsed since the last update. If the update took twice as long (i.e. frame rate was halved), then deltatime would be doubled. We multiply this deltaTime throughout our game's update methods to ensure that no matter what the frame rate is, our character will move by the same amount given the same time period. Of course, this means that our speed could go from 1 pixel per second to 10 pixels per second. If we have a thin wall, this sudden increase in deltaTime could mean that our collision detection system will break. That is why we cap the deltaTime (it is capped at 3.15 in the above example) so that if the game slows down too much, then we will let movement depend on frame rate so that we do not break our entire game trying to maintain consistent movement. This is prioritization at work. Now that we have discussed our "window" let's discuss input. Right click on com.yourname.framework.implementation and create a new Java Class called AndroidInput. Here, you will implement the many abstract methods that you have created in the Input interface. In Android 2.0, multi-touch was introduced. So in this implementation, we check the SDK build version (5 equates to Android 2.0) and implement the appropriate touch handler (which we develop below!). Right click on com.yourname.framework.implementation and create a new Java Class called TouchHandler. This simple class handles touch events by checking for touchDown and the X and Y coordinates. Right click on com.yourname.framework.implementation and create a new Java Class called SingleTouchHandler. Right click on com.yourname.framework.implementation and create a new Java Class called MultiTouchHandler. // returns the index for a given pointerId or -1 if no index. The two previous classes make a heavy use of the Pool class. As I doubt many people will be interested in knowing how this class works (you cannot really do much with it to change your game), I will hold off on describing it for the sake of time. Perhaps I will update this lesson once Unit 4 is completed so I can discuss how it functions. The final class we will create is the AndroidImage class. Right click on com.yourname.framework.implementation and create a new Java Class called AndroidImage. Here, you will implement the many abstract methods that you have created in the Image interface. Our last class is very straightforward. All the methods are self-explanatory! The framework is finished. We are ready to build our first Android game. The next lesson will discuss how we will go about creating our game using this framework, so people porting their own game can learn how to do so, and people who are following the tutorial to completion will know which way we are headed. The source code is available in the next lesson! 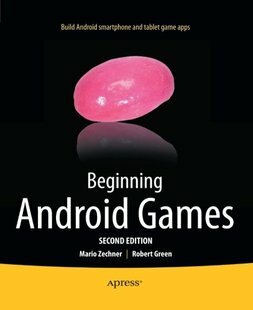 Go to "Create an Android Game..."